Home » Questions » How many pills of Cytotec should I use? You must take six (6) pills of Cytotec/Misoprostol. This amount of pills is enough to cause a safe and efficient medical abortion. There is no need to take higher doses or to change it according to the lenght of pregnancy. This given amount is suitable for pregnancies up to 12 weeks. To induce an abortion, you have to take 6 pills of Misoprostol (Cytotec – 200mcg). It is common to have unqualified professionals, as it happens in the “black market”, that suggest higher variations according to the lenght of pregnancy. That is utterly UNNECESSARY and is merely part of a SCAM in which people charge higher values for this product, depending on the level of desperation of the woman that is in a hurry to get an abortion. The right dose of Cytotec suffers slight variations depending on the lenght of pregnancy. However unlike the information given in several websites, the number of pills of Cytotec necesary to provoke an abortion DECREASES as pregnancy progresses. This happens because the uterus becomes more sensitive to everything that may stimulate it. 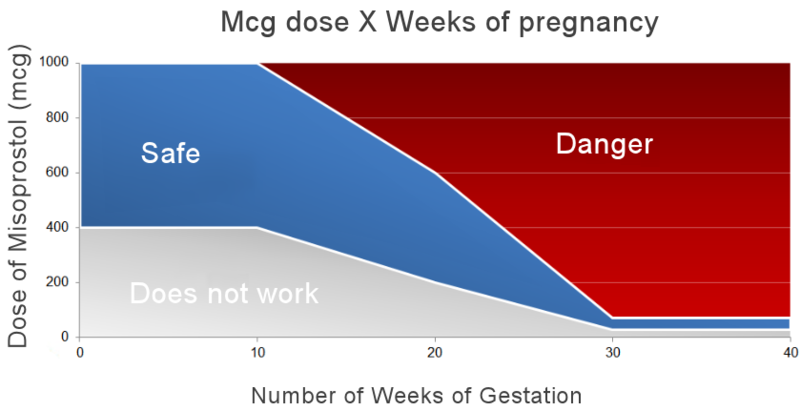 It’s important to look at the blue section which shows that, as the pregnancy advances, the danger area increases. This happens not only due to the risk of bleeding, but also because the fetus is getting more developed, thereby generating a higher volume of tissues that must be expelled during abortion.